I bought this serum to, first of all, strengthen the vessels of my facial skin. I have a very small couperosis--near the nose and a little on the cheek--and I really do not want it to progress. Resveratrol has to cope with this problem (besides, I also take it in capsules). The antioxidant property of Resveratrol is an additional plus. According to research, it is 50 times stronger than vitamin E, and 20 times more than vitamin C. My second aim was an extremely gentle peeling for my sensitive and demanding skin. At the moment I am taking a course of Buffet serum with copper peptides and I wanted to slightly help the active ingredients penetrate the skin. I didn’t have any special expectations from this serum, besides, it’s really difficult to measure and estimate the quality of antioxidant protection. Antioxidants may be referred to the anti-aging care, it is a work for the future result, and only time will show if I chose the right treatment. I love The Ordinary for their laconic compositions. 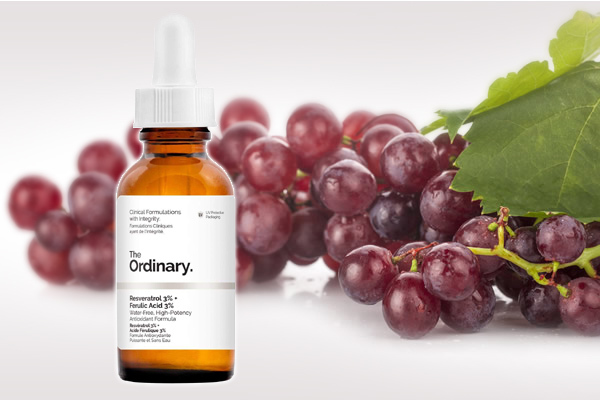 All you will find in The Ordinary Resveratrol 3% + Ferulic Acid 3% serum is propanediol, resveratrol and ferulic acid. Of course, all the work is performed by the two latter components. Resveratrol is absolutely natural polyphenol, which is mainly contained in the red grapes (skin and seeds), cranberry and blueberry. If damaged or stressed, the plants release Resveratrol to protect themselves, and then to rehabilitate. The best result can be reached if you take Resveratrol per os, but it is also used for cosmetic purposes. So, the main function of Resveratrol is protection. When applied topically, it protects the skin from the harmful effects of sunlight, stimulates collagen synthesis and reduces cell damage by free radicals. It also has an evident anti-inflammatory effect and helps relieve redness or rash on the skin. Ferulic Acid is an antioxidant which is able to neutralize several types of free radicals at once. It also has anti-inflammatory and bleaching effect of the average intensity. The source of the ferulic acid is the plants walls. The name of this ingredient translated from the ancient Greek means "something that never withers". So, let’s hope, that ferulic acid protects from wilt not only plants but also our skin. 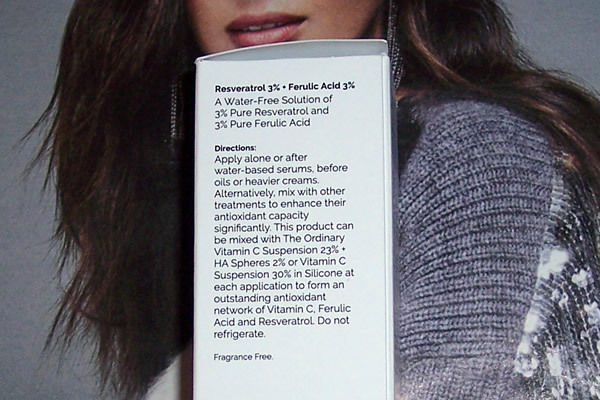 Ferulic acid has the ability to absorb ultraviolet waves. And what is interesting - the effect of ultraviolet only increases the antioxidant activity of ferulic acid. 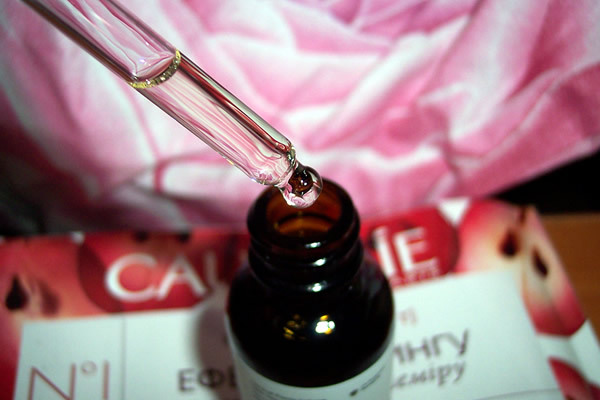 Ferulic acid helps stabilize and enhance the effects of other antioxidants, such as vitamin C. Therefore, The Ordinary experts recommend using this serum in combination with other products containing vitamin C (Vitamin C Suspension 23% + HA Spheres 2% or The Ordinary Vitamin C Suspension 30% in Silicone). Ferulic acid renovate skin cells very good, that is brings peeling effect. After 2-3 days of application of this serum, exfoliation may appear. And it’s a good sign, since it means the serum works. Propanediol being one of the ingredients of The Ordinary Resveratrol 3% + Ferulic Acid 3% serum delivers active components to the skin cells. Propanediol is obtained by the fermentation of corn syrup. It is a viscous, thick and colorless liquid. Although propanediol is not toxic and absolutely safe component, still its high concentrations may cause skin irritation. And since the serum contains about 94% of it, this percentage can be considered more than high. Note!This serum is not recommended to be combined with antioxidant serum The Ordinary EUK 0,1%, because EUK is destroyed when being mixed with any acid products. Antioxidants are very sensitive to light, so this serum is packaged in a dark glass bottle. Everything is simple and moderate, just the way all The Ordinary products are. It’s very easy to take the serum from the bottle since the packaging is provided with a pipette. This, of course, is not the most ideal packaging option, the bacteria still get inside, but at least there is no contact with the skin of hands. 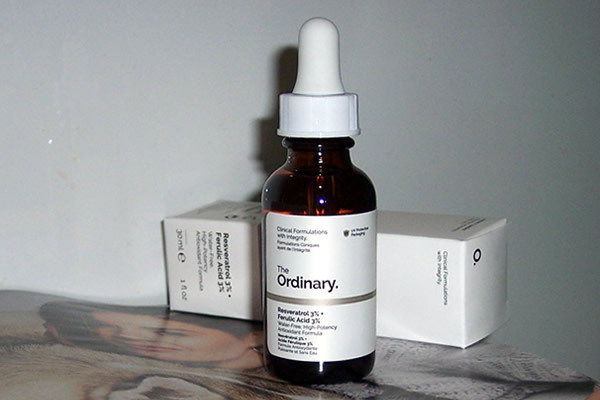 The Ordinary Resveratrol 3% + Ferulic Acid 3% serum has an oily texture. However, it is quickly absorbed, although it leaves a very thin oily layer on the skin. That is the reason why I never use this serum in its pure form under makeup. But if you blot the excess with a napkin or mix it with other care products, you can use it during the day. The color is transparent with a slight yellowish. As for the smell, I didn’t feel any. Oh, how did my attitude towards The Ordinary Resveratrol 3% + Ferulic Acid 3% change during the period I use it (and this is about three months)! From the very beginning I was embarrassed because of the feeling of intense warmth, occurring immediately after the serum application. It feels like hot steam effects the skin--and this is a very strange feeling. Five minutes later, all the skin was covered with red spots. After 30-40 minutes everything went away, but this reaction of the skin absolutely did not suit me and I was really worried. Nevertheless, I decided not to abandon the serum at all, but try to mix it with other moisturizing products: 1 drop of The Ordinary Resveratrol 3% + Ferulic Acid 3% for 3 drops of other serums. Gradually, I increased the concentration, and after a while my skin got used, and now it doesn’t react even to undiluted serum. Therefore, even if your skin is not sensitive, it is better not to risk and bring The Ordinary Resveratrol 3% + Ferulic Acid 3% into your care procedures step by step. I tried different application techniques. At first I mixed 3 drops of his serum with 9 drops of The Ordinary Marine Hyaluronics (that's where it came in handy!!) in my palm and apply on my face with a finger. Then I began to drip pure serum in my palms and lightly pat my face and neck. Consumption is quite economical, 4-5 drops for face and neck are enough for me. The first week of use, I could not get used to the oily texture of the serum, but later I got accustomed to it. It feels warm on the palms and face during application. It is surprisingly quickly absorbed, and after that the face becomes fresh and renewed. It doesn’t cause blackheads and rashes. I also noticed one amazing thing: when I use it over a serum with vitamin C, my face does not shine very long after that (despite its oily structure). As I already wrote above, it is difficult to assess antioxidant protection, but a large percentage of the active components suggest that the serum works anyway. 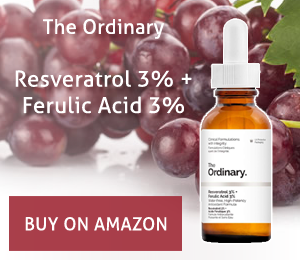 Therefore, if you are looking for a low-cost free radical protection agent, then take into account The Ordinary Resveratrol 3% + Ferulic Acid 3%. ..and my cheeks became less red in the cold air. I can’t use it in summer because of the oily texture, so I decided that I would do courses in spring and autumn (most likely I will combine it with vitamin C serums). Note: Ferulic acid has such a delicate effect that many cosmetologists recommend using it even in summer. Sometimes, it does not even cause exfoliation. But Resveratrol, being a natural component, can cause individual intolerance (allergy) in some people. If you are among them, you will know about it immediately: purple spots or abundant red rashes will appear on your face. 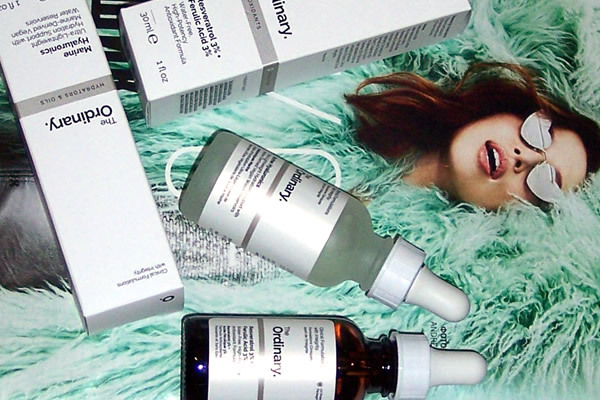 What to do: before the first use of serum The Ordinary Resveratrol 3% + Ferulic Acid 3% stock up on antihistamines. 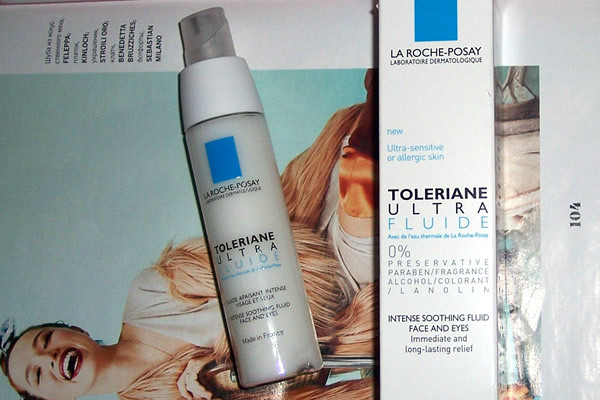 If redness causes you to worry, drink a pill, rinse off the serum and apply a calming product such as La Roche-Posay Toleriane Ultra Soothing Moisturizer for Very Sensitive Skin. Neurosensin, which is contained in the La Roche-Posay Toleriane Ultra series, deeply soothes the skin, relieving irritation and itching. Please note: for the first time, apply the serum only on the skin of the forehead--it is thicker and less sensitive. This will tell you if you are allergic to Resveratrol. Almost every brand now offers cosmetics with antioxidants, so everyone has heard about them, but few understand why they are needed. So I decided to figure out what free radicals are, what damage they cause to the skin, and whether or not we really need anti-oxidant products. If simplified, then free radicals are formed as a result of the interaction of oxygen molecules with other molecules. Oxygen molecules themselves have an even number of electrons, so they are nonreactive and do not adversely affect the skin. However, when they combine with other molecules, the number of electrons in oxygen molecules can become uneven and they cannot neutralize each other. Such molecules with an uneven number of electrons are called free radicals. They begin to attack the cells, which leads to aging of the skin, loss of elasticity and dull color of the face. The body, of course, fights free radicals, eliminating or slowing down the chain reaction with the help of antioxidants. But if there are a lot of free radicals, then the body does not have time to cope with them and they begin to cause more and more harm. Free radicals are formed both due to internal processes in the body, and due to the influence of external factors (such as ultraviolet light, environmental pollution, smoking, alcohol consumption). Free radicals caused by internal factors are easily neutralized by healthy eating. Green juices, smoothies, various berries, vegetables and fruits are rich in antioxidant components, and, moreover, are very useful for the organism all-in-all. The most well-known antioxidants that can be obtained from food are vitamins A, C and E, Omega-3 and Omega-9. As for the "external" free radicals, to neutralize them we need skin care products with antioxidants. 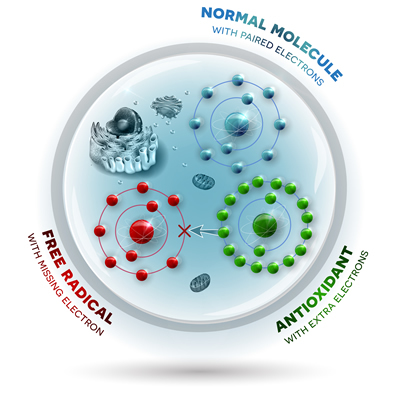 Antioxidants help stop chain reactions caused by free radicals. They prevent damage, but they are not able to eliminate existing wrinkles or other signs of skin wilting caused by free radicals. That is why products with antioxidants must be present in the care products constantly, and you can add them into skin care quite early. Many antioxidants work best together, complementing and enhancing the properties of each other - for example, vitamins C and E, Glutathione, Alpha Lipoic Acid and Coenzyme Q10. Therefore, cosmetics containing several antioxidants at once work much more efficiently than separate components. In the fight against free radicals, you should pay particular attention to protecting your skin from ultraviolet radiation. Some sunscreens contain antioxidant ingredients. But it’s better to apply antioxidant serums in addition to the sunscreens, which according to some data intensify the work of sunscreens up to 8 times.